Heat oil over med-high heat and sauté onion and garlic for 2 minutes. Add turkey & cook 2-3 minutes, stirring to break it up, until it’s no longer pink. Add remaining ingredients. Cook uncovered, stirring occasionally, for 15 minutes. Note: I sometimes add a 2nd can of beans (pinto) and 1/2 cup more liquid for variety (and more servings). 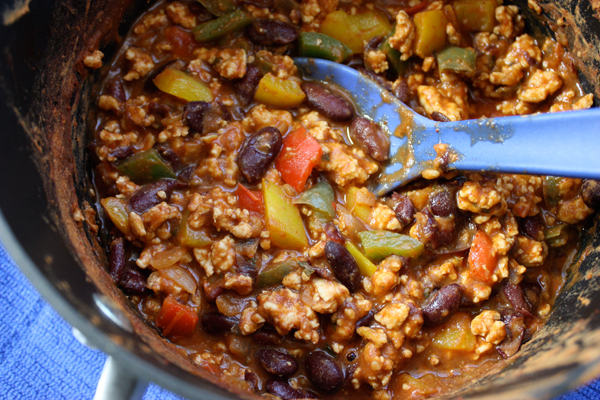 13 Comments on "Easy Turkey Chili"
Made this last night, what a delicious success. And by “success” I mean flavor. So easy, healthy! !, yet fully dimensional flavor profile. Nom, nom, nom. Thanks so much for this, Jenny. You give me life!! I made the easy turkey chili tonight. A double batch for 9 of us, so delicious! Even my grandson who said “I don’t like food cooked in a pot” ate his. Still looking for you to do a video on making poppyseed kolaches. How do I determine the Nutrition Facts? What can I substitute for the jalapeño pepper that won’t be so hot? Thanks. Anaheim peppers, also called long peppers, are very mild. Jenny, I just came across your u-tube video and am going to try several of your healthy recipes. Thank you! Thank you for your vidoes, much obliged. The men in my home enjoy a hot chili meal on a cold winter’s night, with warm cornbread muffins. Love chili recipe, can you add celery and black eyed beans to recipe? Chili is always a flexible recipe for adding ingredients but keep an eye in case you need a little more liquid. Hey Jenny love your recipes. Quick question do I drain the juice off of the turkey once its browned, or do I leave it? If you are using ground white turkey breast there should not be any juice or fat to drain off. But if you’re using dark meat or a combination of white and dark, you don’t have to drain it off because the juices will adds flavor but if the liquid has a lot of fat and you’re looking to eat less calories, I would drain it off. what do u mean by the ingredient Pomi strained tomatoes? Pomi is a brand of tomatoes that comes in a box and are popular here in the U.S. (http://www.pomi.us.com/StrainedTomatoes.php) You can use any canned, strained, tomatoes. In fact, I have made this chili with tomato sauce, canned diced tomatoes, and tomato puree. Chili is a very flexible dish so almost any tomato product can be used. I just prefer the thick, strained tomatoes. I appreciate your question because I will now clarify this ingredient for my international visitors.